Are you finding it difficult to get your employees to cooperate with you and your management team? If so, your organization is not the only one that has this problem. However, it is possible to improve the employee engagement levels in any organization and you can achieve this in the following ways. Unfortunately, many business owners and business decision makers blame their employees for poor employee engagement levels. However, the problem may lie closer to home. The way you manage your business and interact with your employees may be a key reason why employee engagement levels are so low. If this is the case, you need to find ways to improve your management skills and you can easily do this by enrolling in an MHA degree program or similar course that will provide you with the tools and knowledge required to interact in a much more effective way with your staff. As well as furthering your own education, you should consider improving the communication skills of your employees too. This simple step has the potential to dramatically improve the quality and amount of internal communication that takes place in your organization. In many organizations, when it comes to management and employees, there is often a ‘them and us’ mentality. Many employees are often suspicious of the people who run the business they are working in and there can be a serious lack of trust between both parties. This suspicion and lack of trust becomes a huge obstacle, especially when you want to get the opinions of your employees and when you need their input. To turn this situation around, you need to be more transparent and you need to explain every action you take, so that your employees fully understand why they take part in certain activities. Ideally, your explanation should include the benefits for your business and your employees when they engage more. The owners and managers of many businesses are rewarded when they reach or surpass certain goals and this is something you should consider for your employees too. Each time an employee makes a valuable contribution, make sure you thank them and reward them in some way. This has the potential to motivate your staff and increase the level of cooperation in your organization. You should look for ways to make it easier for your employees to engage with you and your management team. Introducing easy-to-follow processes is one way you can do this. The easier you make this process, the less resistance there will be and you should get more participation. 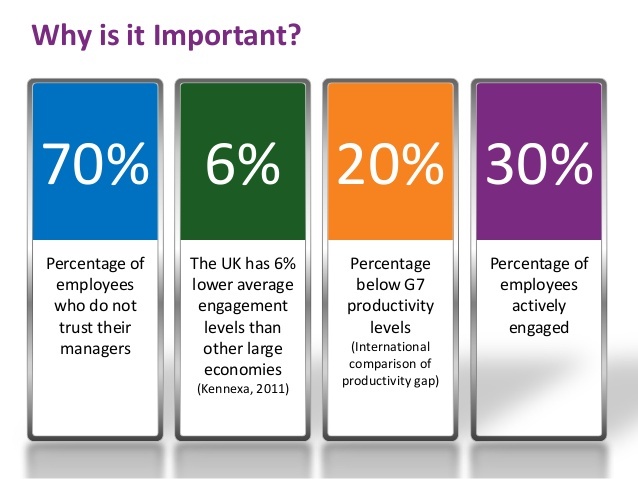 Improving your employee engagement levels is an important exercise in any organization. The quicker you can address this issue by following the tips above, the quicker you can start to build a much stronger, inclusive organization, where employees trust the people who manage them and vice versa.